We say our farewells this morning and hit the road for Bronxville and our last night in America. 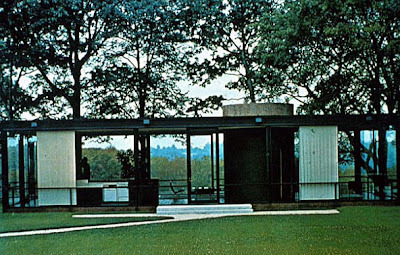 Sonnet suggests that we visit Philip Johnson's Glass House, an early work of his in New Canaan, Connecticut. Irritatingly, the $25 per person tours are booked solid for '07 and '08 and the in-town visitor center won't give us the address so I beg directions from a taxi who eventually tows us to a place which turns out not to be The Glass House but I take this photo of the imposter anyway. Beforehand, we have lunch on the cute little High Street and watch perfectly groomed mums, their nannies and totally hot, manicured teenagers wearing prada or La Coste moving along in packs. It turns heads, or at least mine anyway. I don't think I would last more than two hours in a place like this. At Starbucks, I comment to the cashier that New Canaan takes itself seriously to which he replies: "yeah, man, and you don't know the half of it." As I'm being served my dry, grande, light capocino a wistful mother-with-baby asks about moving to London. Grass is always greener, they say. FYI - THIS is The Glass House which was probably 100 feet from us. So it goes.